Radiation is one of the best-investigated hazardous agents. Because of the vast accumulation of quantitative dose-response data, specialists are able to set environmental radiation levels so that applications of nuclear technologies may continue at a level of risk that is much less than with many other technologies. The above list is given for information purposes only. The doses that can produce such effects are extremely unlikely even in the event of an accident at the U of T.
The delayed effects of radiation are due to both acute exposure and continuous exposure (chronic exposure). In this case, the negative effects may not be apparent for years. The chronic exposure is likely to be the result of improper or inadequate protective measures. In the case of inhalation or ingestion of radioactive materials, a single “acute” event may cause a long period “chronic” internal body exposure due to irradiation of tissue where radioactive material has been fixed. The most common delayed effects are various forms of cancer (leukaemia, bone cancer, thyroid cancer, lung cancer) and genetic defects (malformations in children born to parents exposed to radiation). In any radiological situation involving the induction of cancer, there is a certain time period between the exposure to radiation and the onset of disease. This is known as the “latency period” and is an interval in which no symptoms of disease are present. The minimum latency period for leukaemia produced by radiation is 2 years and can be up to 10 years or more for other types of cancer. The connection between effects of exposure to radiation and dose (i.e., dose-response relationship) is classified into 2 categories, non-stochastic, and stochastic. Stochastic effects are those that occur by chance. They are more difficult to identify since the same type of effects may appear among individuals not working with radioactive materials. The main stochastic effects are cancer and genetic defects. According to current knowledge of molecular biology, a cancer is initiated by damaging chromosomes in a somatic cell. Genetic defects are caused by damage to chromosomes in a germ cell (sperm or ovum). There is no known existing threshold for stochastic effects. One single photon or electron can produce the effect. For these reasons, a stochastic effect is called a Linear or Zero-Threshold Dose-Response Effect. Stochastic effects can also be caused by many other factors, not only by radiation. Since everybody is exposed to natural radiation, and to other factors, stochastic effects can arise in all of us regardless of the type of work (working with radiation or not). Whether or not an individual develops the effect is simply a question of chance. There is a stochastic correlation between the number of cases of cancers developed inside a population and the dose received by the population at relatively large levels of radiation. Attempts have been made to extrapolate the data from these levels of dose to low levels of dose (close to the levels received from background radiation). There is no scientific evidence to prove the results of these attempts. Since there is no evidence of a lower threshold for the appearance of Stochastic Effects, the prudent course of action is to ensure that all radiation exposures follow a principle known as ALARA (As Low As Reasonable Achievable). We will be referring to the application of this principle at U of T in subsequent modules. It is well known that the foetus is more sensitive to the effects of radiation than the adult human. If an irradiation occurs in the first 30 weeks of pregnancy, delayed effects may appear in the child. These include mental and behaviour retardation, with a delay period of approximately 4 years. Because of these possible effects, dosimetry during pregnancy differs from the usual protocol. Special attention is paid to both external and internal irradiation. A Radiation Safety Officer of the U of T must review procedures for handling radioactive materials when a pregnant worker performs such work. It is not possible to accurately measure the dose to the foetus and so it must be inferred from the exposure to the mother. Radiation protection principles limit exposure to the mother in order to achieve minimum risk to the foetus. Exposure to very low levels of radiation is a controversial issue, originating many debates throughout the scientific community. What happens at very low levels of radiation exposure (a few percentage of the background), on top of the day to day natural irradiation), it is not known. As was explained earlier, everybody is exposed to a level of radiation called the natural radiation or background radiation. Also, was proved that the background levels vary on earth by a factor greater than 10. There are not enough data to support extrapolations of the effects from high levels of exposure (like the survivors of Hiroshima and Nagasaki bombing, uranium miners, medical exposures, etc.). However these extrapolations are made. 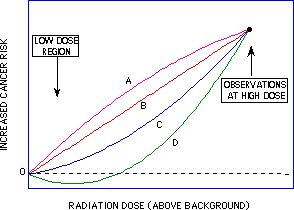 There are four mathematical models use to describe the effects of low level of radiation. All are supported (more or less) by controversial epidemiological studies, or by extrapolation conclusions obtained from studies with other mammals to humans. Model A considers that at low level there is an increased effect (above proportionality). Model B (also called LNT model) considers than any increase in dose results in a proportional increase in cancer risk with no threshold. Model C considers that at low doses there is only a slight increase in risk that becomes proportional to dose at higher doses. Model D (also called Hormesis model), considers that low doses of radiation have a positive effect and decreases overall risk of cancer.